This is a great hunting tripod, and it is available for well under $50 from Bushnell. It has a few important features that are not found on very many other tripods. I often encounter shooters struggling like mad while using high powered spotting scopes just because their tripod wasn't well designed for this purpose. This particular hunting tripod is very stable and quick to adjust. It has a gravity locking ring for fast vertical scope positioning within a 3" range, and it will lock in place as you release it. To lower the position of your scope, lift this lock ring above the legs; and the scope can be lowered to any height in one second flat. This tripod has a course vertical adjustment and a "precise" vertical alignment. This allows you to locate your target quickly and track it by swivelling the scope anywhere you want it. To raise or lower your view slightly, just dial the knob below your scope. 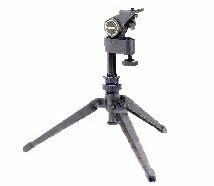 This tripod is great for shooting woodchucks from a portable shooting bench or when you are shooting from the prone position. However, if you need a higher tripod, you can easily install an extension to the center shaft. This is one of those items that makes shooting and hunting more enjoyable. If you already have a tripod like this and you have ever had to borrow some rickety tripod with flakey adjustments .... then you know what I mean.